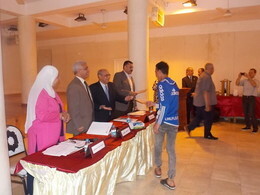 On the 30th of May 2016, ACCD held a Ceremony on the occasion of a number of children and workers at "Door El-Tarbiya" Institution for Social Welfare obtaining literacy certificates, along with the opening of the first training workshop on the rehabilitation of children in street situations (children of hope) to obtain ICDL certificates. This event is a milestone in the Project since receiving such certificates by children of hope is deemed a beginning of a brighter future for them. Further, training children of hope to obtain ICDL certificates is a bridge of hope for those children to cross and reach out to an age they own its tools. Thus, the Project achieves its objective of the rehabilitation and inclusion of those children in a decent human life through confidence, education for hope, self-discovery and the development of life skills eligible for social inclusion. During the ceremony, the Advisor of the Minister of Social Solidarity expressed his appreciation to ACCD for the efforts exerted in implementing that Project, which has produced a qualitative leap in the experience and practice of social workers, calling ACCD to continue its cooperation with the Ministry to support this Project.